Frank Ocean fans just got a little sweetener in their voting process today. The singer/songwriter announced via his Tumblr page that fans who vote in Miami, Houston, Dallas and Atlanta during Tuesday’s midterm elections can get free merchandise. 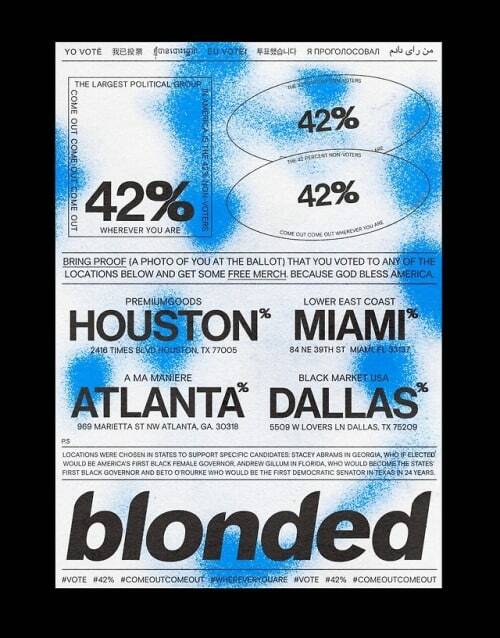 Per the post, voters will receive free merchandise if they bring proof that they voted to Premium Goods in Houston, Lower East Coast in Miami, Black Market in Dallas, and A Ma Maniere in Atlanta. Ocean announced the move in support of four candidates, Beto O’Rourke in Texas, Stacey Abrams in Georgia and Andrew Gillum in Florida. Ocean also urged people to get to the polls on Tuesday morning on a special midterms edition of his blonded radio show on Beats 1. Remember though, in some states such as Florida and Texas — it is illegal to take a selfie inside your polling station.